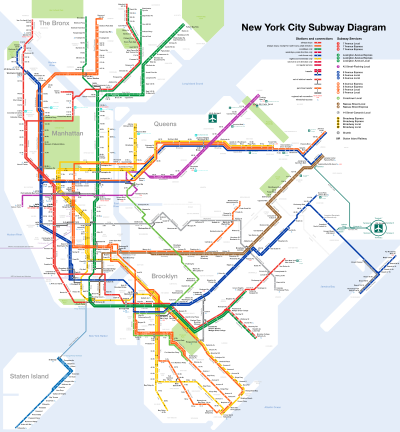 The current New York City Transit Authority rail system map. The Staten Island Railway (on the bottom left portion of the map) is owned by the NYCTA but is a separate entity from the New York City Subway, and the AirTrain JFK (the dark green line at the middle right) is not operated by the NYCTA. The New York City Subway is a rapid transit system that serves four of the five boroughs of New York City, New York: the Bronx, Brooklyn, Manhattan, and Queens. [a] Its operator is the New York City Transit Authority, which is itself controlled by the Metropolitan Transportation Authority of New York. In 2015, an average of 5.65 million passengers used the system daily, making it the busiest rapid transit system in the United States and the seventh busiest in the world. The present New York City Subway system is composed of three formerly separate systems that merged in 1940: the Interborough Rapid Transit Company (IRT), the Brooklyn–Manhattan Transit Corporation (BMT), and the Independent Subway System (IND). The privately held IRT, founded in 1902, constructed and operated the first underground railway line in New York City. [b] The opening of the first line on October 27, 1904 is commonly cited as the opening of the modern New York City Subway, although some elevated lines of the IRT and BMT that were initially incorporated into the New York City Subway system but then demolished predate this. The oldest sections of elevated lines still in operation were built in 1885. The BMT, founded in 1923 and also privately held, was formed from the bankruptcy of the Brooklyn Rapid Transit Company. The IND was created by the City of New York in 1921 to be a municipally owned competitor of the two private companies. Unification in June 1940 by the New York City Board of Transportation brought the three systems under one operator. The New York City Transit Authority, created in 1953 to be a public benefit corporation that acquired the rapid transit and surface line (buses and streetcars) infrastructure of the Board of Transportation, remains the operator of the New York City Subway today. The official count of stations is 472; however, this tabulation classifies some transfer stations as two or more stations, which are called "station complexes" within the nomenclature of the New York City Subway. If station complexes are counted as one station each, the number of stations is 424. Thirty-two such station complexes exist. The reason for the higher count generally lies in the history of the New York City Subway: IRT, BMT and IND stations are usually counted separately, particularly if their lines are not parallel and are adjacent to or on another level to each other. Regardless of how stations are counted, the New York City Subway has the largest number of rapid transit stations in the world. There are numerous New York City Subway stations that are closed, many of which stem from the demolition of elevated lines once operated by the IRT and the BMT that were made largely but not completely redundant to underground lines subsequently constructed. The newest New York City Subway stations are part of the Second Avenue Subway, and are located on Second Avenue at 72nd, 86th and 96th streets. They opened on January 1, 2017. Stations that share identical street names are disambiguated by the line name and/or the cross street each is associated with. For example, "125th Street station" can refer to four separate stations: 125th Street on the IND Eighth Avenue Line (A, ​B, ​C, and ​D trains), the IRT Broadway–Seventh Avenue Line (1 train), the IRT Lenox Avenue Line (2 and ​3 trains), and the IRT Lexington Avenue Line (4, ​5, ​6, and <6> trains). This situation occurs numerous times. Of the 472 stations in the system, 470 are served 24 hours a day. 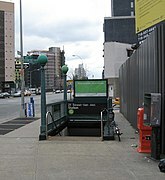 [c] Underground stations in the New York City Subway are typically accessed by staircases going down from street level. Many of these staircases are painted in a common shade of green, with slight or significant variations in design. Other stations have unique entrances reflective of their location or date of construction. Several station entrance stairs, for example, are integrated into adjacent buildings. Nearly all station entrances feature color-coded globe or square lamps signifying their status as an entrance (see below). This means that 61% of the stations are below the surface (59% being fully underground and about 2% with most of the station below the surface). 39% of stations are above the surface or overground. 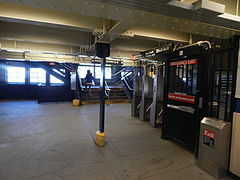 The New York City Subway primarily employs two types of turnstiles: a waist-high turnstile, and a full-height turnstile known as a High Entry-Exit Turnstile (HEET). The waist-high turnstiles, the most prominent in the system, were installed beginning in 1993 along with the implementation of MetroCard, though they originally accepted tokens. 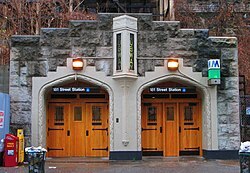 The newer HEETs resemble several older turnstiles of that design informally called "iron maidens", and are prevalent at subway entrances without token booths to discourage fare evasion. Both turnstiles are stainless steel and are bidirectional, allowing passengers to enter with fare payment and to exit. A third older type of turnstile, the High Exit Turnstile (HET), is a black-painted unidirectional iron maiden and only turns in the exiting direction. Entrance is also available via Service Entry gates or AutoGates, which cater primarily to handicapped passengers or passengers with large items such as strollers and luggage. These gates double as pushbar Emergency Exits, though they are often used for regular exiting in crowded stations. At most of the system's entrances and exits, there is a lamppost or two bearing a colored spherical or cube-shaped lamp. These lights roughly indicate the station's availability (i.e. how often it is accessible): green means a full-time entrance and booth, red means either a part-time booth or no booth, hence either exit-only or entrance with MetroCard. Older lamps are completely colored green or red, while newer ones, called "half-moons", have only the top half colored, while the bottom half is milky white; this is to provide more light, and the half-colored globes have the same meanings as the globes with full colors. There are also some square lamps. The meaning of the lights is poorly understood by passengers, and was originally more complicated. Green, yellow, and red lights were introduced in the early 1980s to indicate the entrance's availability, mostly to prevent muggings by warning riders away from entrances that were closed at night. Originally, green signified an entrance located at a full-time station booth, which was open 24/7 and had regular waist-high turnstiles; yellow signified a part-time booth, to which access to the platforms could be gained using High Entry-Exit Turnstiles (HEETs); and red signified an exit-only. This proved too complicated and yellow was dropped in the early 1990s. Red globes now indicate both part-time entrance or exit-only; indeed, a joke when the system was introduced was that "green meant go in, red meant don't. And yellow meant take a [yellow New York City taxi] cab." Many stations in the subway system have mezzanines. In underground stations, this typically consists of the first level below the street or the areas between the street and platform level. 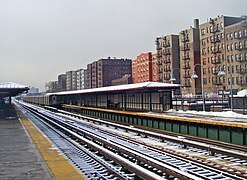 For open-cut, grade-level and elevated stations, prevalent in uptown Manhattan and the outer boroughs, the mezzanine area often consists of a station house at street level or above the street. Mezzanines allow for passengers to enter from multiple locations at an intersection and proceed to the correct platform without having to cross the street before entering. At busy intersections, they also act as a pedestrian underpass or overpass. They also allow for crossover between uptown and downtown trains on side platforms or a pair of island platforms, which is very useful when local tracks are closed for construction. Within the mezzanines are fare control areas, where passengers physically pay their fare to enter the subway system. In underground subway stations built close to ground level or under narrow streets, a characteristic of early IRT and BMT construction, the fare control area is at platform level with no mezzanine crossovers. Many elevated stations also have platform-level fare control with no common station house between directions of service. For various reasons, including maintenance costs, decreases in ridership, along with crime and safety issues, many stations have fare control areas, mezzanine areas and entrances that have been closed. Many mezzanines that previously stretched the entire length of a station have been split or partitioned by fencing or permanent walls. These closed areas have been abandoned or converted into space for Transit Operations or the New York City Police Department. In August 2006, the MTA announced that all future subway stations, which include 34th Street–Hudson Yards, South Ferry, and all Second Avenue Subway stations, will have platforms outfitted with air-cooling systems. The existing Grand Central–42nd Street station also has these cooling systems; however, for the most part, subway stations lack air-cooling systems due to their expense, and only a few stations have ceiling fans. The MTA Arts & Design program oversees art in the subway system. Permanent installations, such as sculpture, mosaics, and murals; photographs displayed in lightboxes encourage people to use mass transit. In addition, commissioned art displayed in stations and "art cards", some displaying poetry, are in many of the trains themselves in unused advertisement fixture slots. Some of the art is by internationally known artists such as Elizabeth Murray's Blooming, displayed at Lexington Avenue/59th Street station. Since the majority of the system was built before 1990, the year the Americans with Disabilities Act (ADA) went into effect, many New York City Subway stations were not designed to be handicapped-accessible. Since then, elevators have been built in newly constructed stations to comply with the ADA. (Most grade-level stations required little modification to meet ADA standards.) In addition, the MTA identified "key stations", high-traffic and/or geographically important stations, which must conform to the ADA when they are extensively renovated. As of September 2018[update], out of 472 total stations in the system, 119 are accessible;[e] many of them have AutoGate access. Five stations on the Staten Island Railway are also accessible. Additionally, there are 16 more non-ADA-accessible stations with cross-platform interchanges, as well as other same-platform transfers, designed to handle wheelchair transfers. 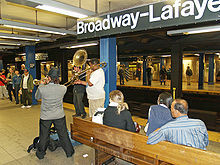 A typical scene of musicians performing on the platform of the Broadway–Lafayette Street station. The New York City Transit (NYCT) is a subdivision of the Metropolitan Transportation Authority (MTA) that operates the city's subways and buses. The NYCT authorizes these types of free expression in subway stations: "Public speaking; distribution of written materials; solicitation for charitable, religious or political causes; and artist performances, including the acceptance of donations." Restrooms are rare in the subway system as only 133 open restrooms are in 81 of the system's 472 stations. Most station restrooms previously open to the public have been closed to the public and converted to storage spaces or for employee use only. However, there are a few major stations that have operating restrooms, including on the concourses of 42nd Street–Port Authority Bus Terminal, Chambers Street, 57th Street–Seventh Avenue, Coney Island–Stillwell Avenue, and Lexington Avenue/59th Street. The majority of restrooms in the New York City Subway are found in express and transfer stations, at ADA-accessible stations, and at terminals, though not all of the aforementioned types of stations have restrooms. Recent plans include "overhauling" and reopening previously-closed restrooms. Newer subway stations have restrooms, including 34th Street–Hudson Yards on the IRT Flushing Line and three Second Avenue Subway stations. Some platforms have newspaper stands that sell various items including newspapers and food. The MTA also installed retail spaces within paid areas in selected stations, including the station concourses of the Times Square complex and the Sixth Avenue concourse at 42nd Street–Bryant Park. According to the MTA, the New York City Subway is home to 345 retail spaces, making over US$70 million in rent and licensing fees in 2009 for the authority. It is continuing to make efforts in attracting more diverse retailers and vendors to set up shop in the subway system. As of 2017[update], there are 111 newsstands in the system, including 20 that are vacant. This includes three empty stands on the Second Avenue Subway that opened that year. Rapid transit and rail connections are available at designated stations to Amtrak, Long Island Rail Road, AirTrain JFK, Metro-North Railroad, New Jersey Transit and PATH. Connections to the Staten Island Ferry and privately operated ferries such as NYC Ferry, NY Waterway and New York Water Taxi, as well as intercity and commuter bus lines at the Port Authority Bus Terminal and George Washington Bridge Bus Terminal, are also available. Free MetroCard-only transfers to buses are available to MTA New York City Transit buses (including the bus rapid transit Select Bus Service), MTA Bus Company, NICE buses (Nassau County) and Bee-Line buses (Westchester County). A typical subway station has waiting platforms ranging from 480 to 600 feet (150 to 180 m) long, though some IND platforms may be as long as 660 to 745 feet (201 to 227 m) long. Platforms of former commuter rail stations, such as those on the IND Rockaway Line, are even longer. Due to the large number of transit lines, one platform or set of platforms often serves more than one service (unlike other rapid transit systems including the Paris Metro, but like some lines on the London Underground). A passenger needs to look at the signs hung at the platform entrance steps and over each track to see which trains stop there and when, and at the arriving train to see which train it is. Almost everywhere express trains run, they run on the inner one (of 3) or two (of 4) tracks, and local trains run on the outer two tracks. In a 3-track configuration, the center track can be used toward the center of the city in the morning and away from the center in the evening, though not every 3-track line has that express service. On a 2-track line, a station may have one center island platform used for trains in both directions, or 2 side platforms, one for a train in each direction. For a 3-track or 4-track line, local stops will have side platforms and the middle one or two tracks will not stop at the station. For most 3- or 4-track express stops, there will be two island platforms, one for the local and express in one direction, and another for the local and express in the other direction. Each island platform provides a cross-platform interchange between the local and express services. In a few cases, a 4-track station has an island platform for the center express tracks and two side platforms for the outside local tracks. This occurs only at three stations near major railway stations where the next station along the line is also an express station with the more common platform configuration. The purpose of splitting the platforms is to limit overcrowding by preventing cross-platform interchanges between local and express services. 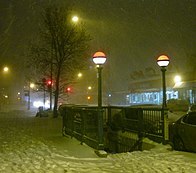 This occurs at Atlantic Avenue–Barclays Center on the IRT Eastern Parkway Line (2, ​3, ​4, and ​5 trains) with an adjacent express station at Nevins Street, where the connection is to the Atlantic Terminal of the Long Island Rail Road; and 34th Street–Penn Station on both the IRT Broadway–Seventh Avenue Line (1, ​2, and ​3 trains) and IND Eighth Avenue Line (A, ​C, and ​E trains), with adjacent express stations at Times Square–42nd Street and 42nd Street–Port Authority Bus Terminal, where the connection is to Pennsylvania Station, one of the two major New York City railway stations. This does not occur with the connection to New York's other major station, Grand Central Terminal, at Grand Central on the IRT Lexington Avenue Line (4, ​5, ​6, and <6> trains), which has no adjacent express station. 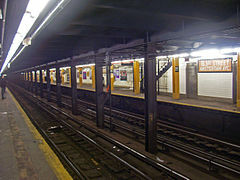 There is one notable 6-track local station, DeKalb Avenue on the BMT Fourth Avenue Line, where trains to or from the Manhattan Bridge either stop at the outer tracks of the island platforms (B and ​Q trains), or pass through and bypass the station on the middle tracks ("bypass express tracks") (D and ​N trains). Trains to or from the Montague Street Tunnel (R and ​W trains) stop across the platform from the respective outer track. The complete list of stations is split by borough. The second column displays the number of stations as counted by the Metropolitan Transportation Authority. The third column shows the number of stations when "station complexes" are considered to be one station each. 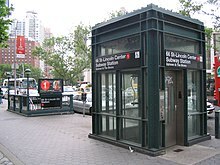 The New York City Subway has several types of transfer stations, among them station complexes (i.e. sets of two or more stations connected with a passageway inside fare control) and stations serving two or more lines (considered to be one station each). The table below only lists the station complexes. For a more detailed list see the main article. The 5 on each of its two northern branches in the Bronx stops at two stations that bear the same name: Gun Hill Road on the Dyre Avenue Line and the White Plains Road Line, and Pelham Parkway on the Dyre Avenue Line and the White Plains Road Line. The B stops at two stations named Seventh Avenue: Seventh Avenue–Flatbush Avenue (BMT Brighton Line) in Brooklyn and Seventh Avenue–53rd Street (IND Sixth Avenue Line) in Manhattan. The D stops at two stations named 50th Street: 47th–50th Streets–Rockefeller Center (IND Sixth Avenue Line) in Manhattan and 50th Street (BMT West End Line) in Brooklyn. 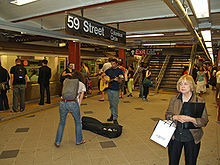 In addition, a third station, Bay 50th Street (BMT West End Line) in Brooklyn, has 50th Street as part of its name. The E stops at two stations named 23rd Street: 23rd Street (IND Eighth Avenue Line) in Manhattan and Court Square–23rd Street (IND Queens Boulevard Line) in Queens. 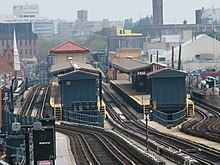 The M stops at two stations named Myrtle Avenue: Myrtle Avenue–Broadway (BMT Jamaica Line) and Myrtle–Wyckoff Avenues (BMT Myrtle Avenue Line), both in Brooklyn. It also stops at two stations named 23rd Street: 23rd Street (IND Sixth Avenue Line) in Manhattan and Court Square–23rd Street (IND Queens Boulevard Line) in Queens. The R stops at two stations named 36th Street: 36th Street–Fourth Avenue (BMT Fourth Avenue Line) in Brooklyn and 36th Street–Northern Boulevard (IND Queens Boulevard Line) in Queens. Dyckman Street and Bedford Park Boulevard were both originally known as 200th Street. These tables list the top ten New York City Subway stations by annual, average weekday, and average weekend ridership in 2017. 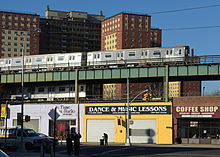 ^ The remaining New York City borough, Staten Island, is served by the Staten Island Railway, a rapid transit system also operated by the MTA but not connected physically to the New York City Subway. ^ Prior to the founding of the IRT, the Beach Pneumatic Transit was an 1869 demonstration for an underground transit system in New York City, measuring 312 feet (95 m) in length. The concept, heavily based on pneumatic tubes, was not adopted. ^ This includes station complexes but excludes some non-accessible platforms at such complexes. ^ This counts both the island and loop platforms of the South Ferry Broadway–Seventh Avenue Line station as one station, even though these are two stations by MTA standards. ^ This includes the Wilson Avenue station, which is partially at-grade and partially elevated, but due to the surrounding topography, appears to be partially underground and partially at-grade, respectively. In addition, Harlem–148th Street is also at-grade, and Botanic Garden is in an open cut, though they seem to be underground. ^ This counts stations that are partially on overpasses, but are not completely elevated. ^ a b "Facts and Figures: Average Weekday Subway Ridership 2012–2017". Metropolitan Transportation Authority. July 12, 2018. Retrieved July 12, 2018. ^ Martin, Andrew (September 9, 2004). "USA: Going underground in New York". The Daily Telegraph. Retrieved July 4, 2009. ^ a b c d e Kennedy, Randy (August 13, 2002). 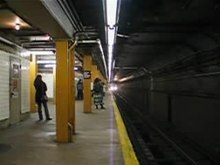 "Tunnel Vision; The Light at the Top of the Subway Stairs". The New York Times. Retrieved July 7, 2008. ^ "www.nycsubway.org: Subway FAQ: Facts and Figures". ^ Faison, Seth (January 21, 1993). "Automating Transit Fares Runs Afoul". The New York Times. Retrieved December 6, 2015. ^ a b c d e f "Reopening Closed Subway Entrances" (PDF). pcac.org. New York City Transit Riders Council. November 2001. Retrieved December 6, 2015. ^ a b c "How to Ride the Subway". Retrieved November 17, 2013. ^ "NYC Official Accessibility Guide" (PDF). nyc.gov. City of New York. 2008. Archived from the original (PDF) on August 7, 2015. Retrieved September 20, 2015. ^ Zimmer, Amy (June 13, 2002). "Stuck in the System: Disabled rider questions subway access". disablednyc.com. City Hall: Metro New York. Retrieved September 20, 2015. ^ Flegenheimer, Matt (December 31, 2014). "Exit Alarms in the Subways Are Silenced by the M.T.A." The New York Times. Retrieved December 6, 2015. ^ "SUBWAY ENTRANCE LAMPS | | Forgotten New YorkForgotten New York". Retrieved February 10, 2016. ^ "New York City Transit". February 9, 1999. Archived from the original on February 9, 1999. Retrieved February 14, 2016. ^ "STATION HOUSES | | Forgotten New York". forgotten-ny.com. Retrieved February 24, 2016. ^ "Construction of Foundations and Structure: Section 1, Jamaica Line" (PDF). New York Municipal Railway Corporation. 1915. Archived from the original (PDF) on March 4, 2016. Retrieved March 4, 2016. ^ a b "MTA New York City Transit Jay Street / Lawrence Street Stations Contract A-35913 / A-35914 / A-35927 / A-35978" (PDF). Metropolitan Transportation Authority. Retrieved December 6, 2015. ^ a b Interborough Rapid Transit Company (June 2007). IRT Interborough Rapid Transit / the New York City Subway: Its Design and Construction. Lulu.com. ISBN 978-1-4303-2550-5. Retrieved February 27, 2016. ^ "www.nycsubway.org: BMT Nassau Street-Jamaica Line". www.nycsubway.org. Retrieved February 25, 2016. ^ "MTA/New York City Transit - Subway Station Booth". web.mta.info. Retrieved March 13, 2016. ^ "Closed entrances at over 100 subways stations create bottlenecks". am New York. Retrieved February 24, 2016. ^ "Brooklyn subway entrances remain locked despite ridership spike". am New York. Retrieved February 24, 2016. ^ Roberts, Sam (September 30, 2013). "No Heel Hazards (or Gusts) as Subway Expands". New York Times. Retrieved May 5, 2014. ^ Donohue, Pete (August 4, 2006). "Cooler Subways Coming – Eventually". Daily News. New York. Retrieved February 10, 2016. ^ Jewler, Sam (August 30, 2009). "Does the New York Subway System Really Need to Be This Hot?". New York Magazine. Retrieved May 23, 2014. However, New York's system now has a few D.C.-style chiller units — some were installed in Grand Central's 4,5,6 station during the Terminal's recent restoration, and there are four in the brand new South Ferry station. ^ Subway Art Hard To Miss, Easy To Uncover Archived July 14, 2011, at the Wayback Machine NY1 local news channel. Made November 11, 2010. Retrieved November 12, 2010. ^ "MTA – Arts for Transit | NYCT Permanent Art". web.mta.info. Retrieved February 10, 2016. ^ a b "MTA Guide to Accessible Transit". MTA.info. Retrieved June 1, 2011. ^ Ramey, Corinne. "Musicians Try Out for Coveted Spots to Play in the Subway". Wall Street Journal. ISSN 0099-9660. Retrieved February 10, 2016. ^ "Rules of Conduct & Fines". mta.info. Metropolitan Transportation Authority. Retrieved February 10, 2016. ^ Haddon, Heather; Klopsis, Nicholas (April 11, 2010). "Flush with filth: Many subway station bathrooms dirty, or locked up". Newsday. Retrieved November 24, 2015. ^ Chatelain, Phillipe Martin. "Hold It In: Why Are Most Bathrooms in the NYC Subway Locked?". Untapped Cities. Retrieved November 24, 2015. ^ "Second Avenue Subway SDEIS Chapter 13: Infrastructure and Energy" (PDF). mta.info. Metropolitan Transportation Authority. Archived from the original (PDF) on May 8, 2014. Retrieved February 10, 2016. ^ Morris, Keiko. "Below the Surface Lies Retail". Wall Street Journal. Retrieved November 24, 2015. ^ Wang, Vivian (2017-10-10). "Second Avenue Subway's Newsstands Are Shiny, New — and Empty". The New York Times. ISSN 0362-4331. Retrieved 2017-10-13. ^ "Press Release – MTA Headquarters – MTA Board Approved Free Transfer Between Westchester County Bee Lines Bus Service and New York City Transit Subway, Buses and Railway Starting in April". MTA. February 5, 2007. Retrieved October 21, 2015. ^ Feinman, Mark S. (2000). "History of the Independent Subway". nycsubway.org. Retrieved February 10, 2016. ^ a b c d e f g h i "Subway Map" (PDF). Metropolitan Transportation Authority. January 18, 2018. Retrieved January 18, 2018. ^ "B Subway Timetable, Effective June 24, 2018" (PDF). Metropolitan Transportation Authority. Retrieved June 24, 2018. ^ "D Subway Timetable, Effective June 24, 2018" (PDF). Metropolitan Transportation Authority. Retrieved June 24, 2018. ^ "E Subway Timetable, Effective June 24, 2018" (PDF). Metropolitan Transportation Authority. Retrieved June 24, 2018. ^ "M Subway Timetable, Effective June 24, 2018" (PDF). Metropolitan Transportation Authority. Retrieved June 24, 2018. ^ "R Subway Timetable, Effective June 24, 2018" (PDF). Metropolitan Transportation Authority. Retrieved June 24, 2018. This page was last edited on 5 February 2019, at 13:54 (UTC).